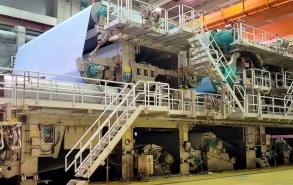 April 5, 2018 - LEIPA announced the start-up of a rebuilt paper machine, PM 5 at its paper mill in Schwedt, Germany. PM 5 produced its first 'paper on reel' on March 31. LEIPA said the start-up period will be completed soon and the machine will begin supplying customers with uncoated White Top Testliner of which PM 5 has the capacity to produce 450,000 metric tons per year. Prior to the rebuild, PM 5 operated as PM 11, which was producing 280,000 metric tons of newsprint annually. Voith conducted the turnkey machine rebuild project, which included a new OCC stock preparation and an extension of the DIP facility at the Schwedt mill.